A seminal day for spot price silver yesterday, when at last we received the long awaited breakout signal, with prices ending the silver trading session with a wide spread up candle, which broke well above the recent sideways price congestion, and ending the session above the $18 per ounce level to boot. 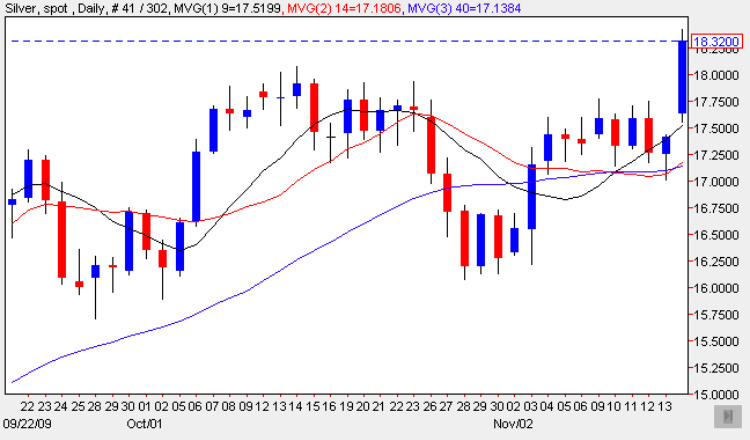 The move higher was given additional impetus from the 9 day moving average which provided a platform to the low of the day, suggesting that this bullish breakout is now firmly established, and with the deep potential support region now sitting below, we can look forward to a period of sustained upwards price action for silver in due course. However, for complete comfort it will be nice to see the $18.50 per ounce price level breached, which marks the upper level of the current price resistance which has been provided such a solid barrier over the last few months, and should we see this achieved following yesterday’s breakout, then we can look forward to a continuation of the bullish trend of the last few months, with spot gold now pulling the industrial commodity higher as it breaks into new high ground. If you are considering trading the silver markets it is essential to use the best trading platform, and in my view there is only one worth considering, and that’s Metatrader 4. As one of the most advanced, yet intuitive, trading platforms available MT4 offers sophistication combined with simple order entry, execution and stop loss management and can be used with a host of expert advisors. The MT4 platform from ODL offers all the above so why not download your free demo copy of the metatrader 4 software by clicking on the following link, download metatrader free, and get started today.